Recycled Maniac Coffee Roaster bears the burden. What burden? Education. This is one of the things I’m most excited about in coffee. While everyone knows about coffee, you can’t really ever know enough about it right? If ever in Bellingham, WA make this a mandatory stop. 205 Grand Avenue. Just go there. 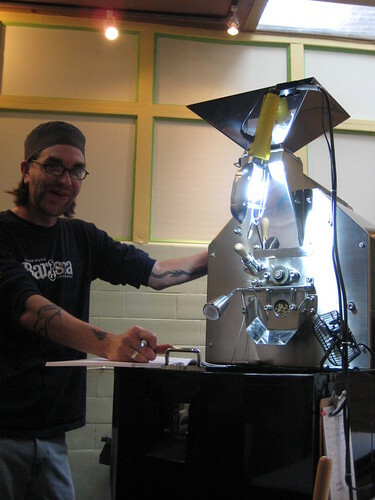 Having just opened Alexarc Mastema and Teri Bryant who own the Black Drop are now roasting as Maniac Roaster. Show up between 8 a.m. and noon M-F and you can purchase a hand poured gold filtered cup and some great alternative brewing devices that will be sure to please any eager coffee geek. Alex was kind enough to allow me to stop in during non business hours and hang out during his roasting time. I walked in just as he was about to dump in his first batch of decaf that he’s roasted in 15 years. Yes coffee is not new to Alex. (The roast came out looking as nice as a sumatran decaf can look – I’ll have to go back just to try this). 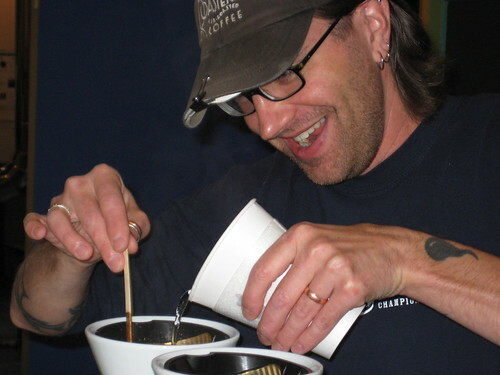 You may notice a few huge black drops tatooed on his arms and think he’s pretty serious about coffee. And he is, but the reason you need to stop by is because he wants to share this. I’ve been following them since they opened… and just dug up this old link where they get great reviews, 4 years ago! In Bellingham I’ve noticed that the way-over saturated coffee scene is full of coffee that meets the local demand that drowns it with cream and sugar, and it doesn’t take much to be the best in town. The Black Drop has continuously raised the bar time and time again. Stop by their place at 300 W champion and get a free dopio on Fridays. To start off great and improve non stop does not happen by accident. Nice job guys. Congradulations on the new space. OMG, Edwin, you are too kind! Thank you for saying such nice things, and we’re glad you enjoy the shop. By the way, I roasted up the Guatemalan, and it not only blew my socks off, but every customer who has smelled it has bought some, and raved about it. It is a flat-out awesome coffee, I have some exciting plans for it. alex, just calling it as I see it and you guys never cease to impress.